1. Place the rock salt, thyme and lemon zest in the bowl of a food processor and mix until combined. Cover the pork belly with the rock salt mixture on a tray and allow to cure for 3 hours, wash off and pat dry, then place on a roasting tray with a rack to allow the fat to drip down. Roast for 90 minutes at 180C until the pork skin is golden and crackly. 2. Meanwhile, while the pork is in the oven in a medium-sized pot with a lid on it, add the olive oil, butter and fennel seeds and slightly toast them for about 1 minute on a medium heat. Next, add the carrots and cover with the lid, stir every 10 minutes or so until the carrots start to soften, then add the apples and cook for a further 10 minutes until soft. Add the honey and blend until smooth. 3. To make the pickled celery, place the sugar, mirin, white wine vinegar, water, star anise and cinnamon into a small pot over a medium-high heat and bring to the boil. Allow to cool and add the celery and radish and rest for an hour before serving. 4. To make the Pedro Ximenes reduction, place the PX in a small pot over a medium heat. Bring to the boil and then set aside and allow to cool. 5. 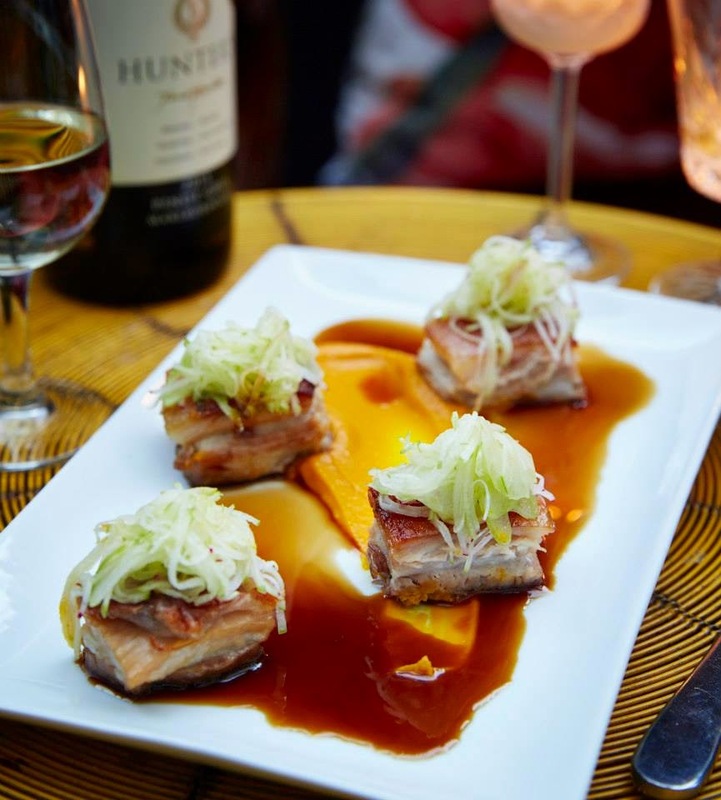 To serve, cut the pork belly into 1cm slices using a serrated knife to keep the crackle intact. Next, spread the puree onto the plate with a spoon and garnish with the pickled radish and celeryDrizzle with the PX reduction to finish.